Richard Tyldesley was born at Arbory on the Isle of Man and baptised on 18 December 1772. The eldest son of Thomas Tyldesley 1733-1783 and Catherine Quayle who had married on 20 August 1771, Richard Tyldesley is directly descended from the Lancashire Tyldesleys and is one of the last members of the original Manx branch of the family. 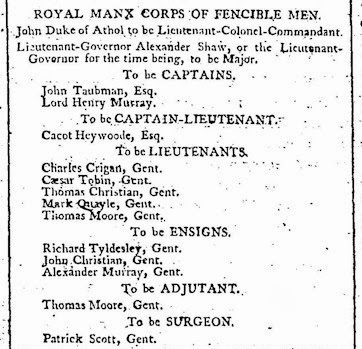 ROYAL MANX CORPS OF FENCIBLE MEN. John Duke of Athol to be Lieutenant-Colonel-Commandant. Lieutenant-Governor Alexander Shaw, or the Lieutenant-Governor for the time being, to be Major. The memorial features the Arms of the Lancashire Tyldesleys—the three molehills. 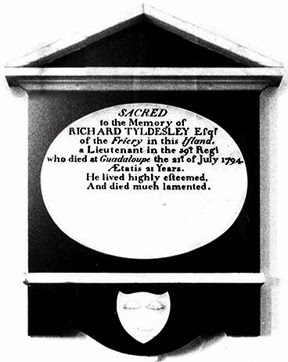 At the time of his death, Richard Tyldesley was aged just 21, unmarried and with no children. He left £5 to his brother, Thomas Tyldesley, and his remaining goods and property to his sister, Margaret Tyldesley 1774-1850. This wealth passed to the Greetham family with the marriage of Margaret Tyldesley and Benjamin Greetham on 14 November 1795. Some 4 years after Richard Tyldesley's death, his brother, Thomas Tyldesley 1776-1798 died on the return voyage from Saint Vincent. And his distant cousin Charles Tyldesley 1774-1808 was to die on the island of Marie Galante, adjoining Guadeloupe. 1. Lord Henry Murray 1767–1805 was the fourth son of the 3rd Duke of Atholl and served as the fourth Lieutenant Governor of the Isle of Man. 2. Douglas 100 Years Ago, Editor: A W Moore, Reprinted from The Manx Sun,1904.